A new study found five pairs of supermassive black holes, each pair preparing to merge. 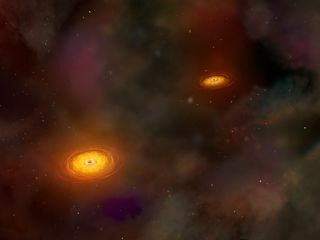 In this illustration, disks of hot gas surround two supermassive black holes located near each other. The black holes will orbit for hundreds of millions of years before finally merging, sending out strong gravitational waves that can be detected on Earth. Astronomers have pinpointed five pairs of merging black holes using three different space- and ground-based instruments and two sky surveys. A new study used data from the Chandra X-ray Observatory, the Wide-field Infrared Survey Explorer (WISE), the ground-based Large Binocular Telescope in Arizona, the Sloan Digital Sky Survey (SDSS) and the Mapping Nearby Galaxies at APO (MaNGA) survey to identify the pairs. They are circling one another before they eventually merge. Finding the black holes could help astronomers understand how the objects produce such powerful gravitational waves when they finally combine. The pairs of supermassive black holes, each billions of light years from Earth, are millions of times as massive as the sun, researchers said in a new statement from Chandra. The black holes are in pairs because they come from two galaxies that collided and merged with each other, putting their central black holes in close proximity. Theoretical models predicted this kind of giant black hole pairing should be relatively common, but the phenomenon has been difficult to see, the researchers said. To find those pairs, astronomers first used the SDSS data to spot galaxies that looked like they were undergoing mergers. Researchers picked out the ones whose centers were less than 30,000 light-years apart and applied the WISE data, looking for colors that matched those of a supermassive black hole. Then, the scientists used Chandra to see if there was a high level of X-ray emission, which marks a growing black hole. And Chandra had high enough resolution to discern two distinct sources of those emissions, the researchers said. That revealed five black hole pairs that fit the bill. Five new pairs of supermassive black holes in the process of merging are identified in data from three different instruments and two sky surveys. The combination of X-ray data from Chandra and infrared data from WISE suggests that large amounts of dust and gas surrounds these supermassive black holes; the observatories were measuring wavelengths that could pierce that material and reveal the pairs. Four of the dual black hole candidates were reported in a paper accepted for publication in The Astrophysical Journal. The other dual black hole candidate was reported in the journal the Monthly Notices of the Royal Astronomical Society and appears online.